Twitter is a very active place this month for the automotive industry: Ford kicked off Fiesta Movement 2 (#fiestamovement); Chevy ran a social media road trip contest to South by Southwest (#chevysxsw); Kia held a Twitter Party with mommy bloggers (#kiasorento); and now Jeep is getting into it with their “Jeep-Tweet-To-Win” contest. Jeep is running a contest from March 15 to March 19 where the first person to answer the correct answer to a daily quiz Jeep-branded question “in the correct format” will win a trip to the New York auto show. 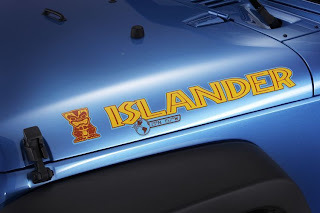 The five winners will then have a chance to win a Jeep Wrangler Islander edition. Jeep will announce each day on its Facebook fan page at 10am EST when the Twitter question will be asked. The five winners will dig in a giant sandbox for a “Golden Tiki” that wins one person the Islander Wrangler. 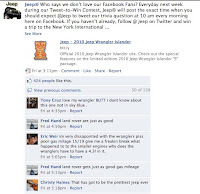 This connection between Facebook and Twitter accounts will attract some more fans and followers to Jeep’s social media accounts, but like all contests it is not really attracting fans, but contest participants who care only about winning not about possibly buying your brand or products. It’s a great way to build a list or add more counts in social media without really building a true fan base or solid leads. Let’s hope the Tiki idea doesn’t further lead to bad luck for the Chrysler group. With sagging sales and a lot of promises of profitability without product to back it up; though, that may change soon enough, the Chrysler brands can use all the Tiki idol luck they can get. However, searching for a Tiki reminds me of an episode of the Brady Bunch where the boys find a Tiki idol that leads to an episode of bad luck situations. While wearing the idol Greg wiped out on his surfboard, Peter gets an unwelcome spider crawling on him at night and Bobby is almost hit in the head by a heavy wall decoration in the hotel room. The ancient curse of the idol can only be reversed if the idol is returned to the Tiki Caves back to its resting place with the ancient island kings. I’ll play and watch the contest this week to see how Jeep promotes the event. They have a small amount of Jeep followers on Twitter (2,307 as of 3/14 at 9:44am.) Perhaps word will get out that a free car is being given away like when Jason Calacanis tried to give away a free Tesla Model S if his @auto account became the #1 account on Twitter. That netted @auto slightly above 10,000 fans but then sputtered out.